Most of the parts for the Bioloid’s power supply have now arrived. Here are some pictures of the Pi 2 being powered by the 11.1 V, 5500 mAh battery. The battery also powers the SMPS2Dynamixel adaptor for the Dynamixel servos. The step-down to 5 V for the Raspberry Pi is performed by a 3A UBEC (Universal Battery Elimination Circuit), which has a handy MicroUSB output. This seems to be the ideal way of powering the Pi, rather than e.g. via the powered hub or GPIO pins, which bypass the voltage protection, especially when considering that the Pi has to power the peripherals. 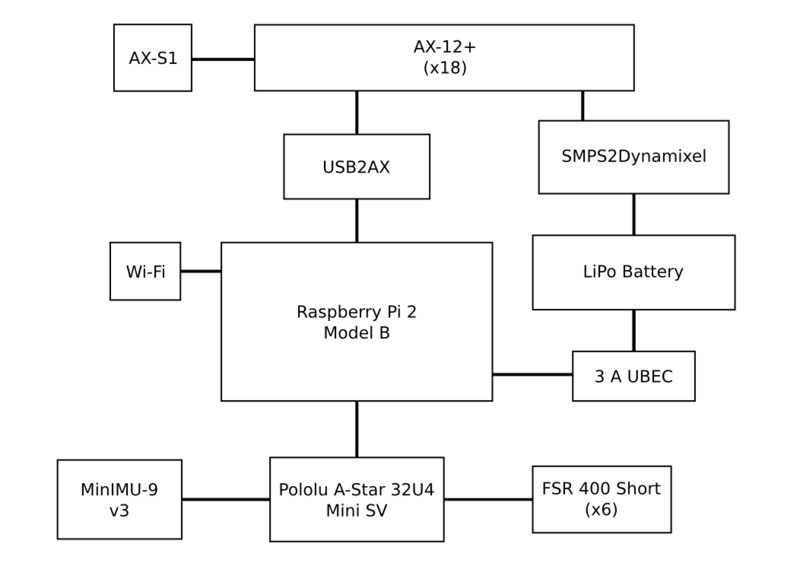 The USB2AX for the servo control is powered via the Raspberry’s USB port, as will the A-Star MCU. The Pi is currently running Raspbian and now also has this great 480×320 touchscreen from Adafruit! I installed ROS Indigo from source using this guide. I have also added Conky on the desktop, a lightweight and fully customisable system monitor, as a way of directly visualising the Pi’s current status. The touchscreen feature of the screen will be of use in the future, if some simple GUI is made for the robot. The next picture shows the current hardware layout of the whole robot. As there is a lot to power, I went for the beefy 5500 mAh battery, but as it weighs 417 grams, I might have to eventually get something lighter for the robot to be able to carry, at the expense of a shorter run time. This entry was posted in Bioloid project, Robotics and tagged 5500 mAh, battery, Raspberry Pi 2, UBEC on April 14, 2015 by dxydas.